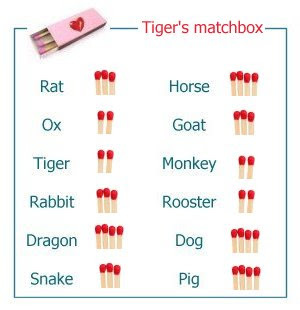 Tiger is the third animal in the Chinese astrological cycle. Tiger is a born leader - courgeous, active, independent and confident. He is dynamic and full of determination and energy. He likes challenges and is prepared to take risks. He is somewhat unconventional and dares to resist authority. Thanks to his multiple charms, he is irresistable and always attracts followers. Tigers make excellent leaders as well as protectors. Tigers are restless and love freedom. They tend to experience constant changes in their life and are adaptable. They are honest and hate dishonesty or hypocrisy. Tigers can be selfish in the little things, but they are capable of great generosity in large matters. Emotionally, they are sensitive and loving deep down. As lovers, Tigers are passionate and romantic. Once commited in a relationship, they make caring and warm-hearted partners. What will the tigers do if they have 2 light bulbs?